Faren Strnad - Founders Brewing Co.
Bio: “A good set has the power to change your entire life.” These words embody the meaning of music for Faren Strnad. Hailing from Grand Rapids, Michigan, she is influenced by the nearby sounds of Detroit – and beyond. A diverse range of art and culture has informed her sensibility as an international DJ, and acumen as Label Manager for NV’D Records. In addition to headlining her own shows she has played alongside a vast array of esteemed artists including Desert Hearts, Walker & Royce, Billy Kenny, Mija, Will Clarke, Christian Martin, Ardalan, Option4 and Matthew Dear. The community has grown Faren, and she works tirelessly to cultivate the same inspiration and joy that she feels through music within the hearts and minds of others. 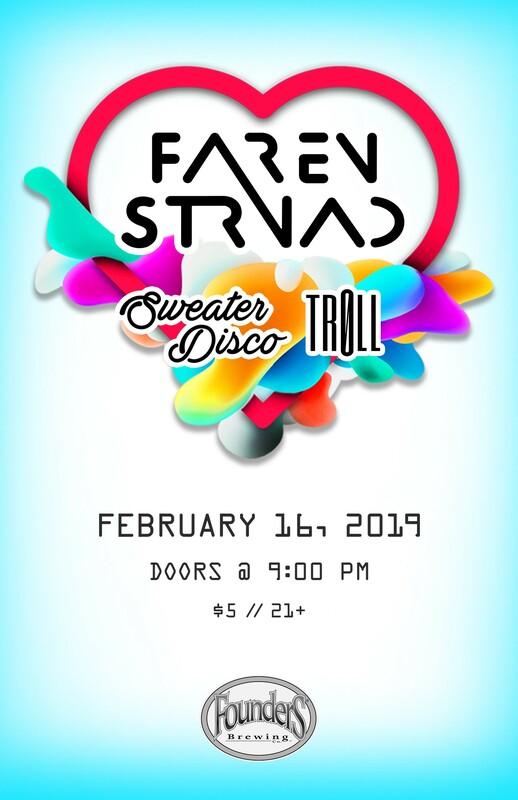 Bio: Ever since he turned 18, Sweater Disco has been a standout club DJ in the Midwest, his productions and live sets shooting the gap between bass music and house to create a unique dance floor experience that never takes itself too seriously. His self-released remixes and original tracks have been covered by NEST HQ, Insomniac Events, and Bass City, and in 2017 he claimed the top spot at the 400 Fest turntablist competition, which only serves as a testament to his drive in both performing and creative work. Expect every variety of club music, along with a solid helping of edits and remixes that serve as secret weapons in every Sweater Disco set. In a very short time Troy Michael, aka TRØLL, has established himself as a big contributor to the Midwest electronic music scene. Within his first year of DJing he secured 3 separate residencies in his city, Bloomington, IN. People expect an eclectic variety of electronic genres when attending his shows. He is most notable for his unique spin on house and bass sets. He started his own company, TRØLL Presents which hosts talented house music producers from all over the country. He has created a community of like minded passionate people. He has played multiple Holy Ship pre-parties and music festival. He has played b2b with artists such as Liquid Stranger, Manic Focus, and Dirt Monkey. His list of acts he has supported is quite extensive, including Ganja White Night, Yheti, SoDown, Cofresi, Muzzy Bear, Bijou, Astronomar, and Gerry Gonza, just to name a few. He stands out as one of the most passionate people in his music scene. Be ready for a dynamic experience that will keep you moving from beginning to end.